I remember a time when I was rushing a paper for a theological course. I try to put down everything I know, not only to impress my professor, but also to prove to myself that I deserve an A. Like many eager beaver high achiever, there is a word limit to the paper. How am I supposed to squeeze my learning into a measly 1500 word essay? Just trying to explain the background, the historical contexts, and the nuances of theologians cited can easily fill 5000 words. On top of that, I need to state the reasons why certain theologians have been selected and why their works are relevant to the essay. When asked whether students can write more than 1500 words, the Professor said no. Anything beyond the word limit means he stops reading. The rationale he gives is rather surprising: "The word limit is there is not to stifle you or to make it difficult for you. It's there to save you from yourselves." That caught me off guard. Me an enemy to myself? How could that be? Surely, we all do our best. Surely we do whatever it takes to be the best versions of ourselves. Surely, we try our very best to do all that we can. Alas! In doing so, we may have given ourselves too much credit. Left unchecked, we become engrossed in our own doings that we forget that we can become too smart for our own selves. We become self-absorbed and in the process become blind to the needs around us. We may even start barking up the tree of self-righteousness, thinking that on our own strength and intelligence that we know best. How we do become our own worst enemy? That is the subject for this week's discussion. There are three ways in which we stumble ourselves. First, we become conceited and blind to others, and fall into the trap of self-importance. Second, we focus on the peripherals instead of the fundamentals. Third, we become more human centered and less God-centered. We are not as important and indispensable as we think. In my years as a corporate executive, I have learned that no man's job lasts forever. Even the highest grossing individual in terms of sales can be laid off in less than a year. A colleague I knew was the best sales representative for one quarter only to be let go within a year. Why? He failed to achieve the increased targets set for him. Many of us were shocked to learn of the corporate decision to let a high performer go. As far as my colleague was concerned, he had done his best. As far as the company is concerned, his best was not good enough. No one is indispensable. Nobody. We may have done our best, but our best will always be a target for other hungry individuals to overtake. The Guinness Book of Records is a good example. People who have gotten a world record in something will not remain there for long. The moment someone else does better, the old record will be replaced. Look at how Olympic records tumble every four years. For those of us who often reminisce the good old days, be ready to see our old records be obliterated by the newbies. For those of us who enjoy beating others to the finishing line, be prepared to be overtaken ourselves when we become old; when we slow down; when we become weaker each day. The very self-importance we put on ourselves can easily be replicated and replaced by others in this Google economy. Look how the Internet has killed off many traditional businesses. 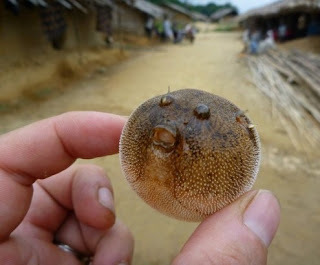 Self-Importance is like a puffer fish. No matter how big you make yourself, you'll still small. When we miss the main thing, we tend to expand on the peripherals at the expense of the central theme. Like my early years as a student, I tend to talk a lot about what I want to say but fail to discuss what the professors want to hear. Without a strong center, there is no use becoming like a puffed up balloon. Like a puffer fish that feels threatened, we can balloon ourselves with air in the hope that our inflated size will scare away our enemies. Alas, they are no match for a hungry tiger shark. The only thing that a puffer fish can do is not to be too confident in its own size but to be hopeful that the tiger shark will not see it in the first place. The religious sects and cults are known for emphasizing on the peripherals. Consider the public perceptions of the various cults. The Seventh Day Adventist made a name for themselves by focusing on the keeping of the Sabbath. Their very name reflects their emphasis. Practicing Adventists will tell you that their faith is more than simply keeping one day a week free from work. The trouble is, by focusing on this one thing, even naming themselves that way, they have unwittingly created the impression that their faith is all about the seventh day. Cults are called cults because they have taken a small thing out of the holy book and magnified that several times. They take a small doctrine and turn it into the main subject. One thing I have learned is to major on the majors and minor on the minors. That means keeping our faith and attention on what is central, and not to be distracted by stuff that is peripheral. We too can endanger ourselves by focusing on the peripherals. One example is to think that we are a good Christian when we go to Church regularly, tithe faithfully, and to simply do good works. Frankly, these are peripheral matters. What is central are not good activities done in Church or at work. What is central is whether we have Christ in our hearts. Do we have the love of God manifested in our good works? Are we obedient to the call of God? In fact, our love for God is directly proportional to our obedience to God. As believers, we are in the world but not of the world. Unfortunately, the moment we become too full of human concerns, we lose track of the things that matter to God. Just look around and you can see people being so engrossed in their own agendas that they fail to be the neighbour that God has called them to be. A boss I used to work for was exactly like that. My fellow colleagues commented: "He is a lousy boss. He only cares for himself and looks after his own things." That's a shame. Having a boss who only looks out for himself will command no loyalties. The only power available to him is positional power, power given to him by virtue of hierarchy. There is no relational power, a power that people are willing to give even when the hard times come. In the pastoral ministry, relational power is something given to us. It is not something that we can grab with clenched fists. It can only be received with open hands and open hearts. A parishioner may choose to speak to the pastor respectfully simply because he carries the title of "pastor." Beyond that, if there is no relationship, the communication lines will soon settle on the level of superficiality. Parishioner A: "Great. How's yours?" Pastor: "Great too. Hope your next week is good too." Parishioner A: "Yeah. Same to you. See you next week. Bye." A pastor focused on human concerns can do a step better. Parishioner B: "Great. How's yours?" Pastor: "Great too. I remember you sharing about your mum's health. Is she getting better?" Parishioner B: "A little bit, but she's getting quite depressed." Pastor: "Oh, really? What's causing her to be sad?" Parishioner B: "She misses her grandchildren. It'll be nine long months before she gets to see them again." Pastor: "Oh dear. That must be quite hard on here. In the meantime, can I do anything to help?" Parishioner B: "Thank you for offering. Maybe, I can get back to you on that." Pastor: "Ok. Feel free to call me if you need help during the week." Someone who is focused on God's concerns will go even further. Parishioner C: "Great. How's yours?" Parishioner C: "A little bit, but she's getting quite depressed." Parishioner C: "She misses her grandchildren. It'll be nine long months before she gets to see them again." Parishioner C: "Thank you for offering. Maybe, I can get back to you on that." Pastor: "Ok. How about yourself? How is your faith in God?" Parishioner C: "Honestly, I've been struggling." Pastor: "In what way, can I ask?" Parishioner C: "I find it hard to get myself willing to do my quiet time. I work hard to make a living and by the time I get back home, I'm too tired to do anything, let alone read the Bible." Pastor: "Oh. It must have been tough holding down a 9 to 5 job. Maybe you can start by doing something simple and go from there, like a brief prayer each morning and evening for a change?" Parishioner C: "Thanks. It's not that I am not praying, but I just don't feel like praying." Pastor: "I appreciate your honesty. Can I pray for you and ask God to help you with this area of your life? Maybe, if you have some time over the week, we can come together for coffee? No pressure." Parishioner C: "Thanks. I appreciate that. I'll contact you." One of the precious things I enjoy as a pastor is when a member of the congregation opens up to me. I let them know that I remember them in prayer. I pray for them. I try to connect with them. Being relational is one of the best gifts a pastor can be. In fact, the pastor maintains a relationship with both human needs as well as God's concerns. Both must be practiced. I know of pastors who become so human centered that they fail to point the parishioners to God, the Giver of all things. When pastors fail to point people toward Christ, they do their parishioners a disservice. Sin works best not by frontal attacks but by flanking assaults. Sin trips us up most by causing us to stumble on our own selves. A fat person can get killed by simply falling upon his own weight. The 9/11 terrorist attacks showcase some of the deadliest weapons that terrorists can use against us. They do not need their own warplanes but domestic airlines (American and United) to bring down the Twin Towers. They do not need their own soldiers but willing citizens brainwashed by their radical ideology to smuggle explosives into American soil. They do not need to use external threats to scare us to death. All they need is to instill fear and once paranoia breaks out, our city's security forces will be outnumbered, outgunned, and outfoxed. We are our own greatest enemy. Left to ourselves, we fall into a bottomless pit of words and self-made righteousness. We sink deep into the quick sand of self-indulgence. For true freedom comes not from the absence of limits but from the presence of divine guide rails. There is hope. When we are in the sinking sand of self, God in his great mercy and grace extends not just a pole but his hand to us. When God shows us his hand, make sure you grab hard and tight. Don't let go, for God will never let go. The only way we can let go is when we become our own worst enemy to slap the hand that tries to save us. What Are Our Blind Spots?